We connect high potential Startups and relevant Investors to create something new together. Store your startup data free of charge, save your exposé and find investors who are looking exactly for your startup. Store your investor profile free of charge, present suitable start-ups and secure high-quality deal flow. Focus on what matters: Your core business. We will find exactly the right investors or startups for you. No more scrambling. The Capmatcher questionnaire guides you through the most important investor questions – step by step. We will create a Capmatcher.Exposé of your startup – just for you. Use it as an intro or sparring partner for your startup presentation! After our successful two-step review process, we permanently list you in our database. Investors can find you there. We manually add you to appropriate investor categories – e.g. Vertical, Stage, Stake and Investor Type. This increases your chances of being selected considerably. More than 100,000 investors worldwide. Let the relevant investors find you – or become active at short notice with optional premium packages. Important: Your project remains protected! Initially, Investors will only see your startup data anonymously. Only after a match, your project will be revealed to an investor. Investors remain anonymous on Capmatcher. Only if a startup is of interest for you, you will get introduced to each other. In a two-step review process, we check all startups manually based on around 50 quality criteria. All startups can be filtered and are categorized according to common investor criteria – e.g. Vertical, Stage, legal structure, team capital requirements and more. About 80% of all startup requests are not suitable or find the wrong investor. We deliver you the interesting 20%. Whether Pre-seed, Seed or mature Series A stages: Capmatcher delivers potential startup leads for all types of investors from Business Angels to corporate venture capitalists. 92% of all Capmatcher startups are open to active support from the investor. Connect with founders who appreciate your help. Capmatcher manually curates the capital requirements of promising Pre-seed, Seed and Series-A startups across all verticals in Germany, Austria and Switzerland – and worldwide from Q2 2019 onwards. Where does Capmatcher acquire startups? Capmatcher has been expanding internationally since January 2019 and acquires startups from the largest and most ambitious startup hubs worldwide. One account – complete access to all targeted countries. The better and higher the quality of the data you deposit, the better the chance of finding a suitable investor. That’s why we need a fully completed capmatcher questionnaire from you. 1.Complete the startup form and answer all questions. A small step for you, but giant leap for your startup! 2.Your data will be checked by specialists against ca. 50 quality criteria and sorted into suitable investor categories for you – including investor type, vertical and stage. 3.Receive your free Capmatcher.Exposé and database listing and let suitable investors find you – 100% anonymously at the beginning. 4.If your startup is of interest, investors can be introduced. You decide how to proceed. Free of charge. 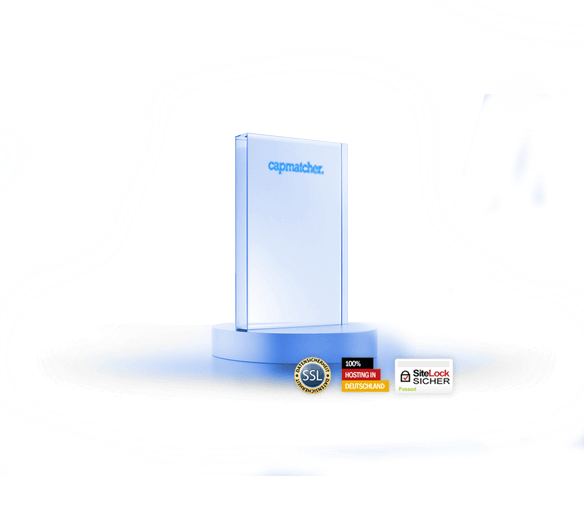 "Capmatcher quickly provided us with information on over 100 relevant investors. Accordingly, we were able to save a lot of time with the service". "As a founder, it is important to keep an eye on the financing situation of your startup. Capmatcher helped us to identify a number of further relevant investors for us". Register and list your startup data for free, secure your exposé and find investors who are looking exactly for your startup.